One Lebanese soldier and a Palestinian militant were wounded in clashes on Wednesday between the Lebanese army and Palestinian militants in east Lebanon. The clashes broke out after an army patrol was attacked by the militants, the army said. The AFP news agency reported on Thursday that both sides sent reinforcements to the area overnight. The militants were from Fatah-Intifada, a secular, Syrian-backed group that has opposed peace agreements with Israel. The group has a camp on Lebanese soil, about two kilometres from the border with Syria. Lebanese police told AFP that the Palestinian group smuggled 15 military vehicles carrying fighters, arms and ammunition into Lebanon from Syria overnight on Wednesday. AFP also reported that the militants took up positions in the mountains overlooking the camps in which clashes took place yesterday. Fatah-Intifada, led by radical Palestinian militant Abu Moussa, was established in 1983. Its headquarters are based in Damascus. 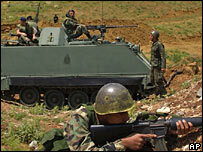 During Wednesday's clashes, a Lebanese soldier was kidnapped by the militants. He was later released, after the army threatened to break up one of the Palestinian group's camps. On Wednesday, the UN Security Council adopted a resolution calling on Syria to forge formal ties with Lebanon and demarcate the border between the two countries. The 15-member council adopted the resolution by 13-0 with Russia and China abstaining. Resolution 1680 seeks full implementation of a 2004 resolution urging a complete end to external influence in Lebanon. It was co-sponsored by the United States, France and Britain. In 2005, Syria withdrew its troops from Lebanon following 29 years of military and political rule over its smaller neighbour, in line with Resolution 1559 of 2004. The move came after Damascus faced massive international pressure following the assassination of ex-Lebanese PM Rafik Hariri, in a bombing with which it denied any connection. However, Damascus has so far refused to formalise diplomatic contacts with Lebanon or open a Syrian embassy in Beirut. Nor has it responded to Lebanese requests that the border between the two countries be officially demarcated. Several Palestinian groups have camps in Lebanon, where about 400,000 Palestinian refugees live. Lebanese factions who have been gathering for a national dialogue conference have agreed to disarm Palestinian groups active in Lebanon outside of the Palestinian refugee camps.